Space, protection from predators and good shelter from the elements. These are the most important things you need to consider when buying a rabbit hutch. Most hutches available today are way too small for a rabbit to live in – period. That’s why we’ve researched and checked out a range of hutches which won’t break the bank whilst at the same time provide a humane amount of space for your rabbit to live in comfort. So, if you’d like to find out more you’ll find all of your answers in our ultimate guide to rabbit hutches. No treatment – but made from thick Fir wood. Removable kick-plate to sweep litter into a bag. Bunny Business is one of the top suppliers of pet products in the UK. 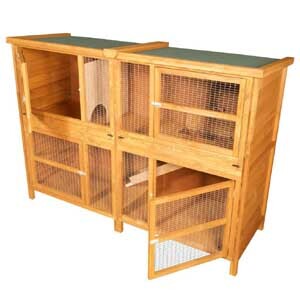 Their two-story 4ft Bunny-Business-Rabbit Hutch is suitable for both guinea pigs and rabbits. It is a simple yet durable and roomy hutch that offers all of the desired qualities of a well-built pet home. Find out about its features, design quality and more in this review. This hutch features the unrivalled top-notch quality that has become synonymous with Bunny Business pet shelters. The entire structure is made using log lap – the same technology that constructs log cabins. As a result, the hutch has inherited the same rustic appearance of cabins as well as the ability to withstand the rigours of outdoor elements. For example, the log lap construction style lends itself to a waterproof structure that and dries quickly when rained on. What’s more, the nailed wood panels on this hutch will hold steady under strong winds and avoid warping when exposed to extreme moisture variation. 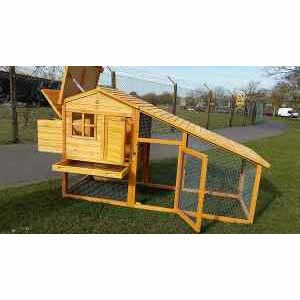 This 4ft rabbit home from Bunny Business features the same design as most 2-tier hutches but with a few tweaks. The upper story, which is the resting compartment, is a simple rectangular wooden structure. However, unlike most 2-tier rabbit hutches, the sleeping compartment is not completely enclosed. It features a small wire mesh window that lets in some light and air, thus increasing the comfort level of the hutch. A removable plastic sliding tray serves as the floor for the sleeping compartment. The sliding tray makes easy work of cleaning the sleeping compartment. On the lower tier (also rectangular in shape), the wall panels are mostly wire mesh with a few strategically placed wood pieces that hold the whole structure together. A ramp connects the 2 levels of the hutch. The suitable ramp gradient allows rabbits to run between the bedding and run areas with ease. Constructed to the size of; 48″ (L) x 20″ (W) x 19″ (H) – hutch size including overhang and 46″ (L) x 36″ (W) x 18.5″ (H) – external run, both the hutch and run are large enough to house a single medium-sized rabbit. With this kind of space, the hutch can easily serve as home to a few guinea pigs or small pets as well. This top-rated Bunny-Business-rabbit hutch and run fits the bill for those looking to accommodate one rabbit or possibly two dwarf breeds. With its charming look and ease of cleaning, it has proved popular with Rabbit owners. Additionally, the roomy design will allow your rabbit to move around freely and enjoy its surroundings. 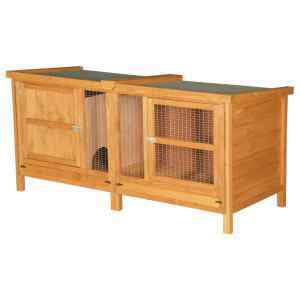 Add the quality materials used in the construction and this hutch pretty much offers all the different requirements that pet owners look for in a rabbit home. Selecting a hutch for your rabbit is a choice that requires a lot of careful consideration. After all, the hutch will be the place where your four-legged friend will spend plenty of time. Therefore, you need to choose a structure that is spacious, comfortable, and most importantly, safe. And, that is exactly what the BUNNY-ARK-Hybrid Double Tier Rabbit Hutch and run offers. By using a combination of materials this hutch assembles to create a structure that is both sturdy and resistant to outdoor elements. Its sloping roof consists of plastic and metal curved edges that hold the hutch together while also ensuring proper water runoff in the event of rain. The rest of the hutch is made of plastic and wood with wire mesh making up most of the lower run area. All materials used are strong, so it will be difficult for a rabbit to get out, and more importanly, for predators to get in. There is even a secure locking door on the lower run area that ensures your rabbit will remain safely inside when playing. Another plus on the construction is the fact that the manufacturer uses treated wood. The white, environment-friendly water-based stain coating keeps perils like wood rot or termites at bay. The first aspect many people love about this hutch is its appearance. Designed in the shape of a small 2-story house in pastel colours that are easy on the eyes, the Bunny Ark is certainly one of the best-looking hutches available. What’s even better is that the design is actually very practical for a rabbit to live in. 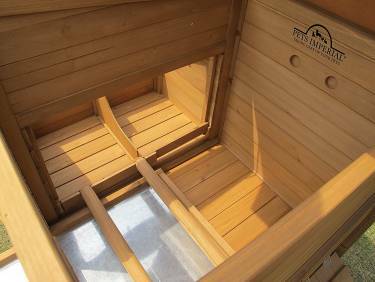 The upper area is completely enclosed, allowing your rabbit to rest or sleep in peace and quiet. Wire mesh panels surround the lower section all-around, which provides your rabbit with fresh air as well as a good view of the surroundings whenever it comes down to play. Both areas are connected by a ramp so your rabbit can climb and descend on its own. This rabbit hutch is quite easy to maintain. The inclusion of a slide out galvanized tray makes cleaning the upper deck super easy. Simply pull out the tray, tap it, wipe the surface clean, and you are done. Cleaning the interior of the hutch is also a breeze thanks to two doors that provide easy access to both the upper and lower section of the structure. Measuring 150cm (L) x 66cm (W) x 100cm (H), the BUNNY-ARK-Hybrid is a moderately large rabbit hutch. With the structure’s double tier design, space it is a very good size for a rabbit hutch. The upper tier of the has enough wiggle room to keep one rabbit extremely comfortable when resting while the lower section offers a reasonable space for your bunny to hop about whenever it pleases. You can even add tunnels, tubes, and other toys to keep your rabbit happy and occupied and still leave enough room for moving around. And, if you want even more space (which we recommend – give your rabbit as much room as you can), there is an extension run available for this unit. Some buyers complain that the ramp leading to the run area is too steep for their pets, particularly guinea pigs. The lower run area does not have a floor. Overall, the BUNNY-ARK-Hybrid is an excellent hutch if you are looking for a structure ensures your rabbit can have a bit of run-room outside its hutch whenever it pleases. With its spacious design and ramp, any bunny will be happy to call this hutch home. A good outdoor rabbit hutch should provide your pet with protection from the elements and predators. That is exactly what this coop is designed for thanks to its sturdy construction. It’s made of 10mm-12mm thick Fir wood, tough wire mesh and shatter resistant Perspex windows. The sloping apex roof allows water to run off easily when it rains. In addition, you don’t have to worry about rust since the wire mesh is forged from galvanized steel. Like most Cocoon hen coops, this particular model features chrome finished, sliding bolts on all doors to keep them firmly closed. And, the inner door to the roost has an innovative locking mechanism as well, which allows you to close it quickly and easily without crawling into the run. Although designed for poultry birds, this hen coop offers everything that rabbits would want in a home. The top level is divided into a nest box and roost, which can serve as your rabbits’ sleeping quarters and living area respectively. Simply remove the nesting box divider and roosting perches/rods to create ample room for stretching. The inner door to the roost opens up to form a ramp, leading down to the run directly onto the ground. Keeping an eye on your rabbits should be easy since this coop has four clear windows for the roost and meshed panels around the run. What’s more, it features a metal lined pull out litter tray and a hinged roof that opens up to provide easy access to the nesting box. Measuring 220cm (L) x 75cm (W) x 113cm (H) (or 7.2 x 2.4 x 3.7 feet), the 7FT long Cocoon chicken coop hen house is large enough for two small rabbits. The hutch meets the dimension recommendations by the Rabbit Welfare Fund Association (RWAF). This means that your rabbits will be able to take at least 3 hops when playing in the run and stand on their hind legs without the ears touching the top when occupying the section in front of the roost. The run falls shy of the recommended 32 square feet of exercise space – but, as with all hutches (whether they include a built-in run or not) you should provide a large seperate area to this for your rabbit to run around, play and be happy! 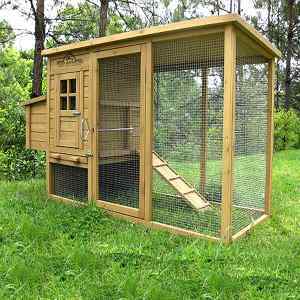 Overall, the 7FT Cocoon chicken house is an excellent choice for rabbit keepers who need an inexpensive outdoor hutch. Despite the low price range (for a hutch this size), this wooden coop is well built. It will hold up to the elements and keep predators at bay. With most buyers rating it highly, the Cocoon chicken coop hen house is worth considering, especially if you are looking for an outdoor hutch that can accommodate two small rabbits or give a single rabbit enough room to be happy. When it comes to the very best that rabbit hutch technology has to offer, the Imperial Wentworth Large Rabbit Hutch and Chicken Coop takes the spotlight easily. Everything from the roof and material, to the mesh in the run area and even the pull-out tray of this hutch screams excellent quality. So, if you want quality accommodation for your rabbit, the Imperial Wentworth hutch & run is definitely worth considering. At first glance, the Imperial Wentworth Rabbit Hutch looks like any other wooden hutch. However, a closer look reveals that this wooden hutch is made of sturdy tongue & groove cladding. The entire structure as well as part of the roof and the run area is constructed from animal-friendly treated timber that is designed to last for years. This material is completely weatherproof and will prevent rainwater from entering the coop. Another plus for this hutch is that you can rest easy at night knowing that your rabbits are safe. This is thanks to a very well made roof and run area. The roof is lined with felt to help it hold up to outdoor elements. And a fox-proof metal grate encloses the entire run area to keep out predators. What’s more, the Imperial Wentworth hutch offers an extra safety feature in the form of an innovative locking mechanism that allows you to shut off access to the run area at night or whenever you are not around to keep an eye on the hutch. This should keep your rabbit safe should a predator dig and tunnel under the wire mesh. Comfort is another area the Imperial Wentworth Rabbit Hutch excels at. This hutch/coop is not only roomy but also has Perspex (solid transparent plastic) windows that allow light into the sleeping area without letting in cold draughts. In addition, there is a solid wood floor under the galvanized metal tray that slides out for cleaning. This feature helps make it easier clean out old straw or rabbit bedding, plus galvonized coating makes it very easy to scrub clean should you need to. This double story coop connects the elevated roost and nesting box to a run that goes directly to the ground via a ramp. Access to the structure is made extremely easy by a combination of an opening roof and multiple doors. This hutch measures 203cm (L) x 75cm (W) x 103cm (H). Unlike the 7ft Cocoon Chicken Coop, this hen rabbit hutch does not have a sloping roof. Instead, its roof is flat. This means your rabbits and other pets get up to 3 feet of height while playing in the run area in front of the nesting box. The living area accommodates two small or medium sized rabbits. It is possible to remove the perches to create more room for rabbits or other pets. Keep in mind though that it would be best to expand the 16 square foot run in order to meet the 32 square feet of exercise space as recommended by the UK Rabbit Welfare Association. Prolonged exposure to wet ground can cause wood rot since the base has no floor and is not elevated. The treated wood has a very strong odour when new, but it airs out with time. As mentioned earlier, this product is for those people who want the very best for their rabbits. The use of a solid wood construction that can withstand different outdoor weather conditions, coupled with an airy and very spacious design makes the Imperial Wentworth Rabbit Hutch more of a luxurious house than a hutch or cage. The Rabbit Hutch Company is one of the leading UK brands known for offering a wide variety of quality pet and animal shelters. 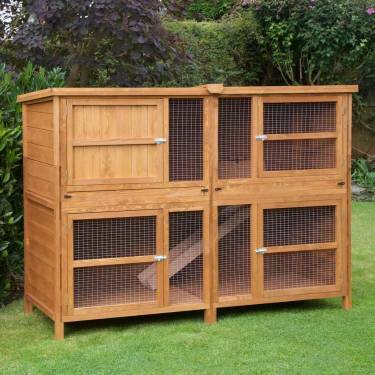 One of their top rated products is the External 6ft Chartwell double rabbit home hutch. 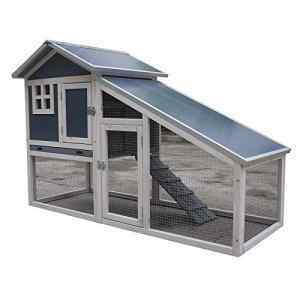 It’s one of the largest hutches available and should provide a great home for any rabbit based on this alone. The materials used to create a rabbit hutch determine its overall build quality. This specific model from The Hutch Company is a wooden hutch designed with 16-gauge wire mesh doors, so you can be sure no foxes can bite through it like they can chicken-wire. Its side panels are made of 10mm tongue & groove Scandinavian timber. Tongue & groove cladding creates sturdy hutches because the boards have slots on the top and bottom edges that fit together snugly to form a tight seal. The plywood floors are finished with a green coat of waterproof paint. In addition, the manufacturer weatherproofs these hutches using an animal safe water based preservative. This helps to reduce deterioration of the wood due to sun and rain exposure. When it comes to keeping your rabbits safe, this hutch does not disappoint. All doors have sliding barrel bolts. These latches are easy for humans to open but not so easy for common predators! As the name implies, this hutch is a two-story dwelling. The upper floor is divided into a sleeping and a living area. An arched door allows access to both quarters and there is also an opening connecting to a non-slip, rigged ramp. The ramp has safety side panels as well that prevent bunnies from falling off when climbing up to the top tier. It leads down to the run in the lower story and gives rabbits a great way to exercise while moving up and down between floors. In addition, a trap door will help you keep the rabbits upstairs when needed. Both levels feature a central wired section, which is perfect for hanging water bottles and toys to keep your playful bunnies entertained. Unlike other rabbit hutches, the 6ft Chartwell double does not have pull-out floors. Instead, the floors have a kick-plate that comes out, making it easy to sweep litter directly into a garbage bag or bin. 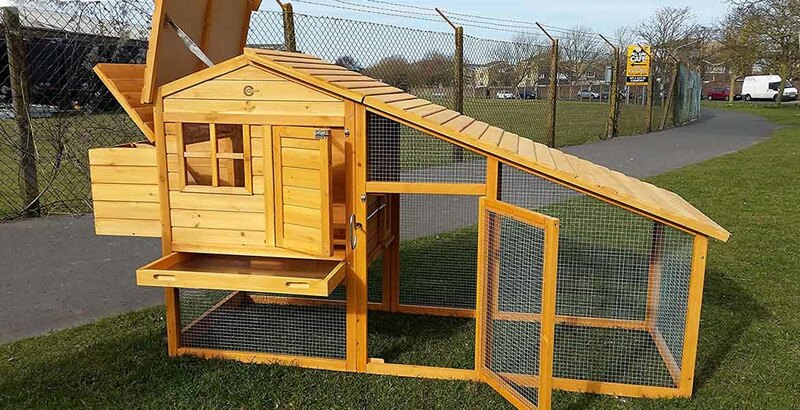 With its spacious two-floor dwelling, the 6ft Chartwell double rabbit hutch offers ample space to accommodate two small or medium sized rabbits. Each floor is two feet high and about 4.2 feet wide. These dimensions comply with RWAF standards and you can still expand the exercise area with a compatible 6′ x 4′ x 2′ Chartwell rabbit run that fits in front of the hutch. For the most part, the External 6ft Chartwell double rabbit home hutch has earned positive feedback except for a few downsides. Overall, this hutch offers good value for the price given its sturdy and secure construction. Keep in mind though that it would be the right choice if you are looking for a spacious home built for two small/medium rabbit breeds. The External 6ft Chartwell rabbit hutch home is one of the many bunny shelters designed by the Hutch Company in the UK. This model has become one of the top selling options on the market, and for good reason. 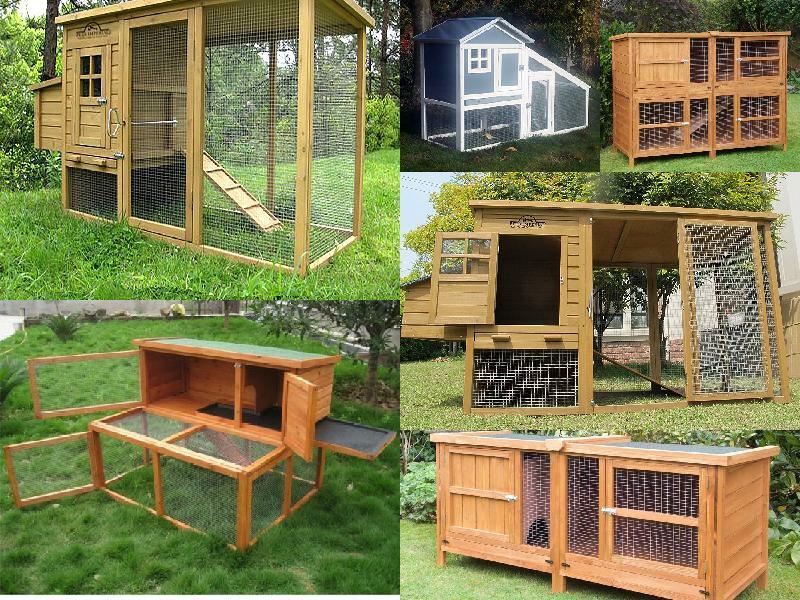 It offers great quality to pet owners who prefer a single tier hutch. But, is it the right home for your furry lagomorph? Below, we’ll review its features, build quality, design, and size so you can head into the buying process being prepared and informed. Read on to learn more. The Hutch Company has a reputation for building sturdy rabbit pens, and their Chartwell single tier design is no exception. Manufactured using 14mm Scandinavian wood, this rabbit hutch is quite sturdy. Its meshed door and front cladding are designed using 16-gauge welded galvanized wire. Predators won’t be able to pry the doors open thanks to the aluminum sliding barrel bolt latches. You can use this hutch outdoors since the wood is treated with an animal-safe preservative that makes the whole structure weatherproof. What’s more, the felt on the roof will help to repel rain and prevent wood resin stains. This unit comes flat packed, so you have to put it together. Instructions and screws are provided in the package to help with assembly. A board with an arched entry divides the sleeping area and run. The retreat section is covered entirely with wood to keep your bunny warm at night. Meshed panels that run the length of the living quarters help you keep an eye on your pet and at the same time provide good air circulation. The XL 6ft hutch does not feature a pull out floor, which is a relatively common feature that is designed to facilitate easy cleaning. However, it comes with a removable kick-plate just below each door. Removing this bit of wood allows you to brush off rabbit droppings from the hutch floor directly into a bin container. As an added bonus, the under door cleaning bar stops wood shavings or other type of bedding from falling out when you open the sleeping area door. 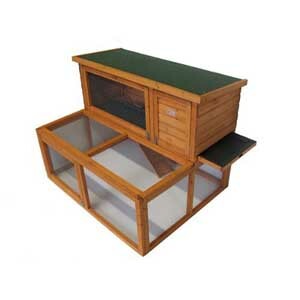 This rabbit hutch can easily accommodate two guinea pigs or one medium-small rabbit. It measures 6′(L) x 2.1′(W) x 2.3′(H), which meets the minimum hutch size recommended by the UK Rabbit Welfare Association & Fund. If you are looking for a quality single-story rabbit hutch under £150 (at the time of this review), then the External XL 6ft Chartwell rabbit hutch home should definitely be on your list. This model has earned lots of positive feedback from buyers and comes at a very affordable price range. A single tier hutch works well for aging bunnies that find it difficult to go up and down a ramp in a two-story dwelling. It is also a fantastic choice if you have young children who love rabbits. Your little ones will find the low height of the hutch easy to access as they learn about responsible pet ownership. If you have adequate space outdoors, buying a proper rabbit hutch ensures your pet’s comfort and health. 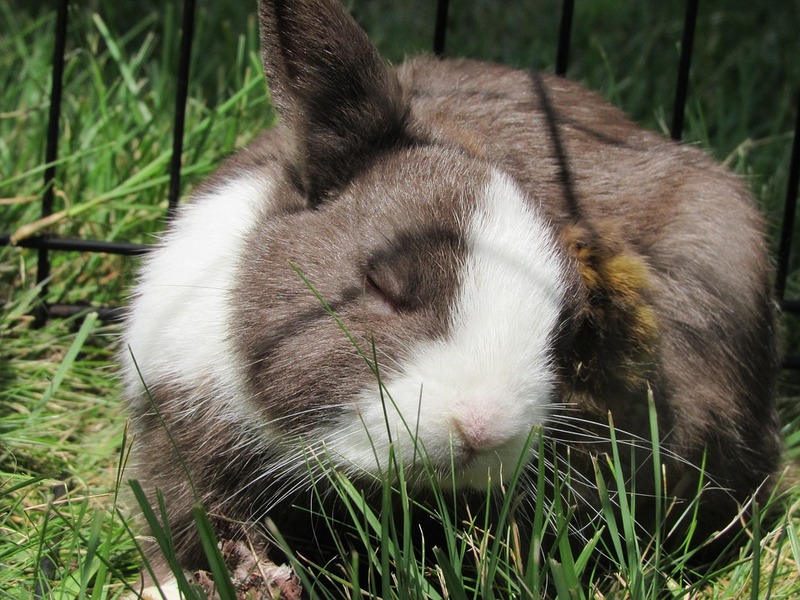 As cute as they may seem, rabbits are also extremely sensitive animals. This means that rabbits living in environments considered unhealthy to them could lead to an unhappy bunny which may develop serious health problems over time. This is one of the most important points to consider when thinking of buying a new home for your rabbits. Small hutches create a lot of problems for rabbits like lack of exercise, loneliness (if you only have one rabbit), and even chronic arthritis pain if they are unable to move for long periods due to lack of space. Other dangers include developing bad habits like pawing, hair chewing and head swaying simply because they are idle and have nothing to occupy themselves with. This rabbit hutch size guide isn’t set in stone but it’ll help you get an idea of what size to buy and it falls inline with the RSPCA’s recommendations on the minimum hutch size to ensure your rabbits well-being. A good way of determining the correct size for a hutch or cage is to have one square foot of hutch space per pound of each rabbit’s body weight. The average weight of a rabbit is around six pounds, so one rabbit would need about 6 sq ft of hutch space or 2 ft by 3 ft. The roof of the hutch should be high enough so as to enable the rabbit to happily stand on its hind legs. All of the hutches we have selected in the reviews above meet this measurements as a minimum. The hutch-and-run style is considered to be the best in housing rabbits. A sleeping area coupled with an open exercise space makes an ideal hutch. Outdoor hutches usually have wooden frames with wire mesh enclosures. Make sure the wood finishing is non-toxic and weather proof. Beware of outdoor dangers like predators, bad weather, and the harmful effects of herbicides, pesticides or poisonous plants. The hutch should have complete protection, particularly at night, even in the city there are predators like foxes, birds of prey and cats which you need to ensure your rabbit is protected from. Make sure the hutch is not too close to a garden area where herbicides and other chemicals are used on the plants. This is especially important if you let the rabbits out during the day as they may eat plants covered with chemicals. Try not to buy hutches with mesh or wire which covers the whole floor. This is uncomfortable for rabbits and they will develop sores on their feet called hocks if living solely on a wire floor. So, remember, it might be easier to clean out but it is not good for your bunny. If you are interested in making the hutch as easy as possible to clean, some hutches come with a slide-out tray in the rabbits main sleeping area and will enable the easy removal of droppings. Regular cleaning is also important for your rabbit and a clean hutch will help prevent urinary tract infections and fly-strike during the summer months. At a minimum you should clean your rabbit’s hutch at least once per week. Once you have cleaned out your rabbit you might be interested to know that rabbit droppings are a good source of manure providing nutrients for plants. All you have to do is just spread the manure over your garden. There is no composting required. Rabbits are prey animals and, as such, need a secure location where they can feel safe. This is why it is important the hutch you select has a private, sheltered area where your rabbit can retreat to if it feels threatened. Other requirements needed in the rabbit hutch include a drip-feed water bottle providing fresh water for your rabbits. A food bowl(s) made of stainless steel or ceramic – so you rabbit can’t eat them, because they will happily chew away on anything! You might could also consider buying chew toys which are ideal to help stop your rabbit’s teeth from overgrowing. They will also help ensure your rabbit stays happy and healthy if it has balls and chew rings to be entertained with. For soft bedding, you can use organic litter shavings, paper towels, or unbleached shredded paper. Many people think of rabbits as simple, cute balls of fluff. In reality they are intelligent, curious animals which need stimulation and room to exercise. Rabbits are fantastic pets for both adults and children. They are fun to play with and can be cuddly. However, rabbits are very sensitive creatures as well. If not cared for properly, they can become stressed, unhappy and develop behavioural problems or pass time by engaging in destructive activities. For instance, aggression, fear towards humans, over grooming, chewing of the cage bars (or wallpaper and electrical wires for a house rabbit), as well as purposeless repetitive digging are some of the signs of an unhappy or bored bunny. On the bright side, it is possible to create an environment that enriches the mental and physical well-being of rabbits. Whether you have already adopted one of these pets or are just researching about their care and welfare needs, read on to learn how to keep your rabbit happy & entertained. Rabbits like to run around, dig and play. As such, they may feel frustrated when confined to a small space and even start to chew on materials that make their enclosure just to break free. To keep your rabbit happy, make sure it has enough space to roam around freely. This means letting it out of the hutch for at least a few hours every day. Rabbits are most active during early morning hours and in the evenings. If you are worried about predators, consider investing in a folding animal playpen and set it out on the grass where your bunny can run around safely inside. You can also attach an extension run to your rabbit hutch to extend its play area. If you are afraid of letting the rabbit out of its cage indoors, consider bunny proofing one room where it can have free reign and not cause damage to your home. Remember, rabbits are active animals. So, increasing the space your rabbit has access to will make him/her happier. Rabbits are inquisitive animals that love to play and explore their surroundings. If left with nothing to do, they can become bored and restless. So, in addition to increasing space, it is important to give these pets something to keep them preoccupied. Rabbit toys offer plenty of entertainment by keeping rabbits busy, providing a way to exercise and creating a stimulating environment that mimics their natural habitat. Here Are a Few Suggestions You May Want To Try. Since rabbits have teeth that grow continuously, they are always looking for something to gnaw. This helps to file down their teeth and prevents overgrowth. You can pick up commercially made wicker balls or even carrot shaped nibble sticks online for this purpose. Just make sure the product you choose is made of untreated wood or get other pet safe toys that are designed for chewing. Alternatively, bunnies love to nibble holes in cardboard boxes and empty toilet paper rolls. Remove all the tape and staples on cardboard before serving it up as a pet toy. Inverted boxes with cut-out holes for doors will offer shade as your rabbit gnaws away on a hot sunny day inside the run. Rabbits are diggers. In the wild, they dig to build hiding tunnels and burrows. If you don’t want your house rabbit to dig into the carpet or the litter box when it’s inside the hutch, provide toys that serve as an outlet for this natural instinct. Your bunny would love scratching and tearing an old telephone directory to bits. Alternatively, get a flower pot or plastic container and fill it with soil, hay or shredded paper. This will provide lots of digging fun for your rabbit. Whatever method works for you, choose a sturdy dig box that won’t topple over when your rabbit hops inside to dig. Rabbits like to throw anything they can pick up with their teeth. Consider making throw toys for your bunny with items found around the house. You can also opt for store-bought throw toys, which are usually made of plastic, sisal or cane and come in many shapes and colours. Hiding is an instinct that comes naturally to these prey species. Providing places to hide can help your rabbit to feel less stressed when spooked as it plays around in the house, garden, or run. 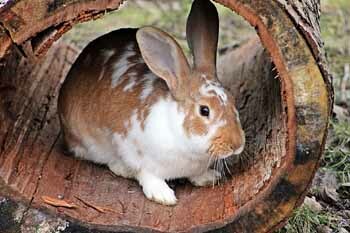 You can buy wooden pet hideaway houses as well as plastic or willow tunnels online or make one using an old drain pipe. These would make good hiding spots and reduce your rabbit’s urge to dig. A healthy rabbit is a happy rabbit. Besides good nutrition, rabbits need lots of physical activity to remain healthy. With that in mind, consider providing toys that encourage exercise. Exercise is important to keep young bunnies fit and prevent them from gaining too much weight and becoming obese. Your rabbit will enjoy hopping onto footstools or small chairs just for fun. What’s more, these raised platforms act as good look-out spots when he/she wants to assess the surroundings. You can also place multi-story bunny castles and obstacles like rabbit dumbbells and jumps to challenge your bunny as it runs and hops around inside the play area. Mix food into hay, hide it inside scrunched up boxes and paper or hang vegetables next to a dangling toy so your rabbit has to stretch and forage for treats. Incorporating food into toys can encourage your rabbits to be more active when it knows that playtime comes with rewards. Keep in mind that rabbits can get bored of toys if they are given the same thing to play with all the time. Rotate toys and activities to keep things interesting so that your pet can always look forward to playtime. While toys alleviate boredom, rabbits still need interaction and attention. These creatures are naturally timid, so they can feel frightened at first when new to captivity. 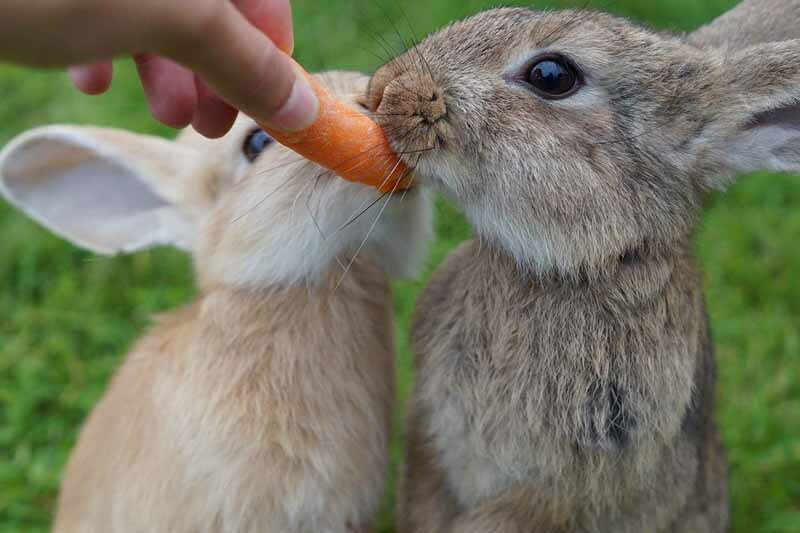 Some rabbits express aggression by biting when you try to pick them up. Spending more time with your bunny can help it feel more secure and at ease when you are around. During playtime, pet your rabbit while offering positive feedback through treats and verbal cues but don’t push any playful activity or toy if he/she is uninterested. This will not only help your bunny adapt at its own pace, but also to associate your presence or touch with safety and happiness. You may also want to consider getting your rabbit a companion. In the wild, rabbits live in big groups. Therefore, having another bunny friend around to play with will certainly be uplifting. However, this only works with bonded rabbits. Rabbits that grow up together often get along just fine. A neutered male and spayed female of the same species are more likely to co-exist happily but make sure to introduce them gradually if they are adult rabbits. Mastering how to keep your rabbit happy & entertained requires some effort and patience. The tips shared above offer a good starting point if you want to make your bunny feel like a well loved and happy member of the family. Rabbits are sensitive, intelligent and wonderful creatures. Unfortunately they have a habit being seen as stupid and their little quirks are not understood by many owners. As such a lot of rabbits spend their entire lives stuck in small hutches and a rarely let out to exercise and play – which is a poor, miserable existence. Even if you do not pick one of the hutches on this page, please make sure you pick a suitably large hutch for your bunny. And always make sure you buy your rabbit a large run and let them get at least 3-4 hours outside every day to exercise and enjoy life – even if the hutch already comes with a small run attached. Rabbits are amazing, if not always understood, creatures which deserve to live healthy and happy lives.